How to Start A Math Fight- Round 3 - How to build productive math discussion and discourse into your daily routine. LET’S GET READY TO RUMBLE!!! Welcome to round 3 of How to start a math fight: Building productive math discussion and discourse into your daily routines. 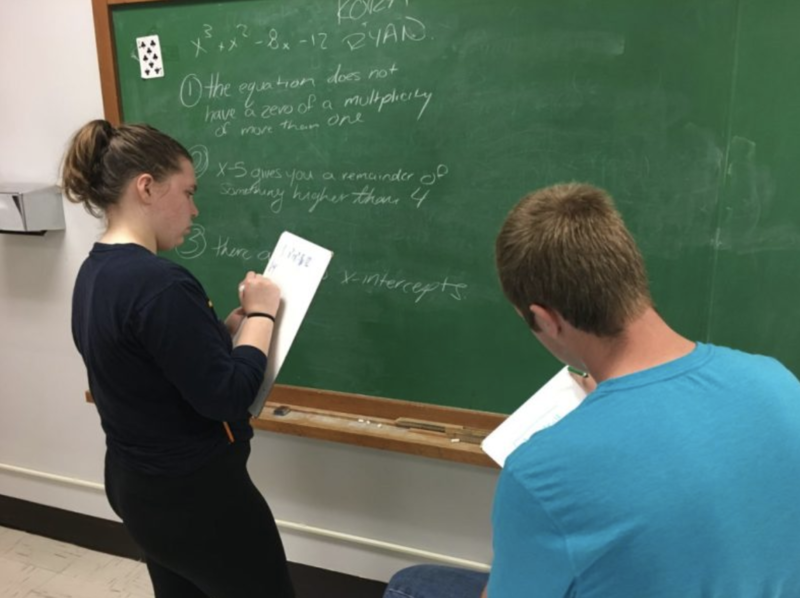 In round 1 of this series I aimed to clarify that a math fight is not a fight, but a phrase centered around students TALKING about their mathematical thinking. 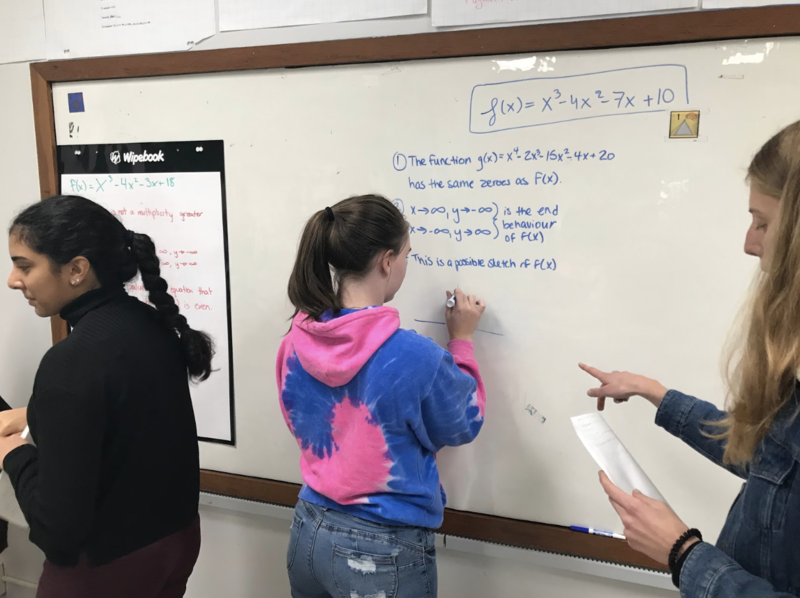 From my experience, having students regularly discuss, argue, defend, and justify ideas using mathematics helps them understand topics more deeply. In round 1 I shared a few examples of how to create out-loud thinking moments. In round 2 I wrote about why we should create moments of controversy and indecision and shared a few resources that you can use in your classroom. In this round, round 3, I want to share one more of my go-to classroom structures that creates moments of controversy. My first teaching job was on a small island in the Caribbean. I have three children. Two of which are twins. Can you guess which is the lie? It was kind of awkward, but fun at the same time. Now, can you imagine how this activity can be used in math class? Here are 4 quick ways you can use Two Truths & One Lie in ANY math class to help create moments of controversy. Two Truths & One Lie (TTOL) is great for setting a low floor for the start of class. I show a picture like this one from mathbeforebed.com which already includes three statements. Students have to determine which statements are truths and which is the lie. WHERE’S THE FIGHT? 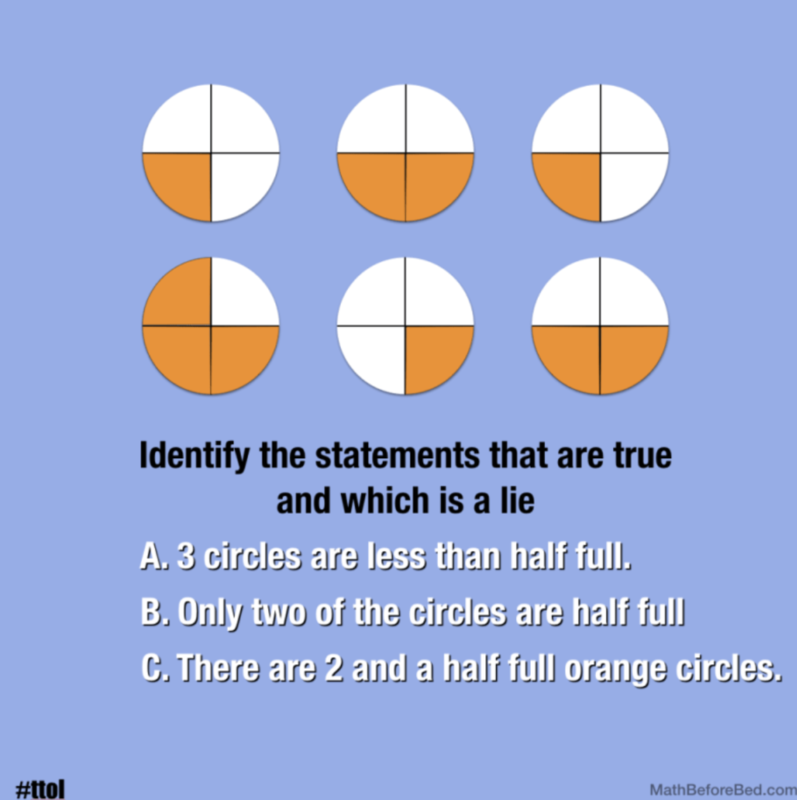 TTOL prompts like this start great math conversations, but the greatest thinking and greatest controversy occurs when we give the image WITHOUT the statements and ask the students to determine true statements and a lie. You’ll be amazed at what those brains will come up with. 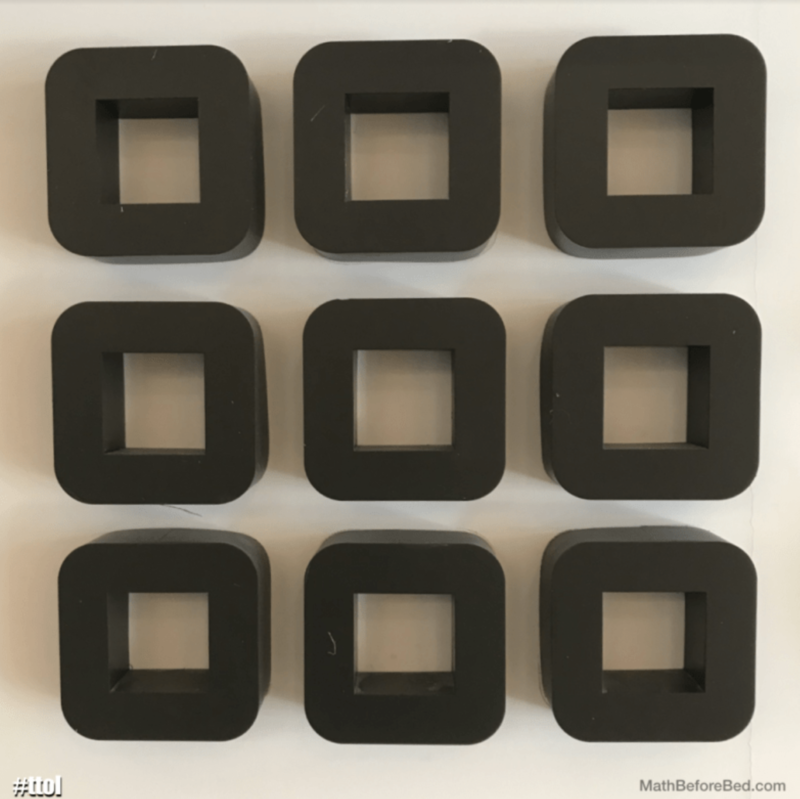 One student may say “I see more than 9 squares” another might jump in to disagree and then boom! the first student will defend their thinking. An instant “share your thinking” moment. Structurally, students can either share their statements out loud for a full class discussion or you can have students record their statements on paper or in your favourite digital tool (Google Classroom, Desmos Activity Builder, Peardeck are a few) that way you can ensure all voices can be heard. If you show an image without the three statements or math items (graph, number, equation, diagram) and have students make their own 2 truths and a lie they can then display their statements around the room with an “answer key” covered up. The class can then participate in a gallery walk where they visit each display as a station and decide which statements are true and which is the lie. Consider the option of having students create their own math item and also create statements to go with it. Now around the room you have a great number of math problems with statements to match and your students created every bit of it! Watch the discussions just naturally happen. When students visit each station and determine which statement is a truth or a lie and check the answer key, there will be times where a student’s answer differs to the answer key. When this happens they shouldn’t come to you the teacher to work out the differences, they will go to the creators! Stand back and watch the great discussion unfold! Here are some pictures of my senior math students participating in the gallery walk. Post around the room many images/prompts and have one statement on each; either a truth or a lie. Your students are to visit the prompts and determine which are truths and which are lies. To put more mystery into the activity you can say “Find 5 truths and 5 lies” Have your students record them and use reasoning to say why each is true or false. WHERE’S THE FIGHT? - After students have determined for themselves which are truths and which are lies pair them and let them compare. Finally reveal the correct statements. Play a round of the “Guess Who” game: two truths and one lie edition. A student will stand up and say out loud two true statements and one lie about a “mystery number.” The student will let the class know which are true and which is the lie. The class has to try to guess which “mystery number” they are thinking of. Can you, dear reader guess the mystery number? Of course you can play with many topics other than numbers. Play with fractions, percent, decimals, 2-dimensional or 3-dimensional shapes, measurement concepts, equations and functions. Choose your favourite activity to run TTOL in your math class or mix them up each week. Watch for the final round of How To Start A Math Fight. Where we’ll look at creating moments of WONDER for your students. 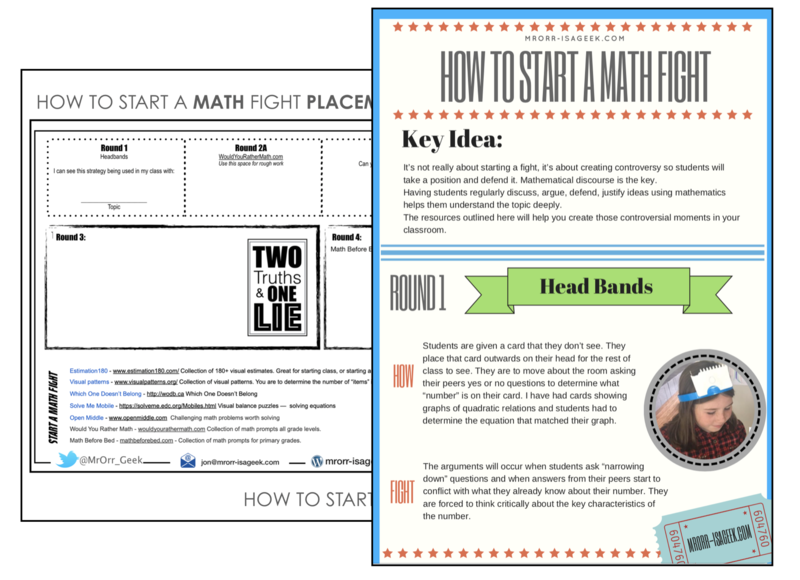 You can download a How To Start A Math Fight Placemat to keep track of your learning in this 4 post series and the How To Start A Math Fight Quick Start Guide. Click here to get the placemat and guide all in one.